Pamplemousse brings authentic, Provencal French flair to the Las Vegas area, just a few blocks east of the Strip. 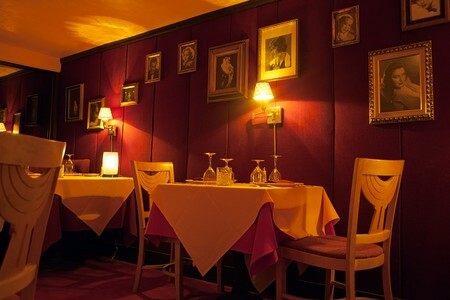 In a quaint and cozy pink stucco building, this is the perfect location for a romantic dinner or intimate conversation amidst the dim candlelight and classical music. Open for dinner, every meal begins with a basket of warm bread and crudités (fresh, raw vegetables) like cabbage, zucchini, cherry tomatoes, broccoli, and cauliflower. Entrée selections include Escargots Bourguignon, Foie Gras “Au Torchon” and a plethora of other traditional French delicacies. An assortment of international wine is also available, from Chile to France, with pricing to meet the needs of every budget. First opened in 1976, Pamplemousse has maintained its status as a local favorite for nearly forty years. 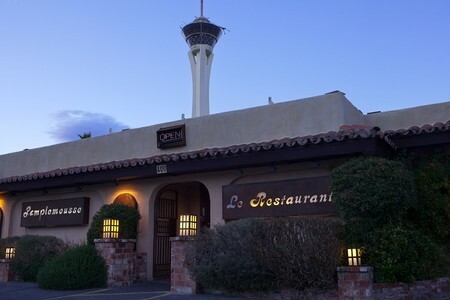 The next time you’re looking for a restaurant with refined elegance and unparalleled service in the Las Vegas area, Pamplemousse on East Sahara Avenue is just the ticket. Pamplemousse; the name alone sparks my interest to learn more, so tonight a friend and I are seeking out one of the few remaining free-standing fine dining establishments in Las Vegas. Located one block east of the strip, Pamplemousse sits just across the way from the monorail shuttles at Sahara Station, occupying the corner of Santa Paula drive and East Sahara Avenue. There are a few parking spaces surrounding the quaint little building. It looks very cozy, and it appears that once, a long time ago, this was a house. It doesn’t surprise me since Pamplemousse sits in the protected historic neighborhood of Beverly Green. The large pink sign makes it easy to spot, so we turn left onto Santa Paula and snag a spot near the restaurant. Approaching the front entrance, we prepare for the unknown and hope for a delicious culinary adventure. I can see the bright lights of the Stratosphere rising up in the background; it actually looks pretty awesome against the dark backdrop of the night sky. As we walk through the door, I am taken completely by surprise; this is so much more than I ever expected when standing outside. Large mirrors help make the small space feel very open, and every table is neatly covered with a pink or white tablecloth, set aglow by flickering candlelight and small decorative lamps. The antique fireplace, dark wood support beams, and a collection of black and white photos featuring different celebrities hung on the pink walls, all help to create an authentic, old-school French cabin atmosphere that is quite different from anything you can find on the strip. With such vibrant red and pink décor and relaxing French music playing in the background to help truly generate a picturesque ambiance, I can tell that romance is the name of the game here. I don’t doubt that every seat in the house is full on Valentine’s Day. Bobby spoke fluent French, and he proclaimed that pamplemousse is the most beautiful word in the language. Although the two never became business partners, Georges chose the name to honor the memory of his good friend. It amazes me how personally connected he is to the restaurant, and I admire how genuine he is in all that he does. With nearly 600 regular customers, both tourists and locals alike, I’d say La Forge has a firm understanding of the wants and needs of his loyal guests and friends. It’s quite obvious that he is deeply passionate about not only his fine cuisine, but the entire dining experience from start to finish. It is no wonder why so many locals frequent this hidden gem of a restaurant, and Georges tells us that he knows a few families in the area that have been dining here for several generations now. He believes that dining at Pamplemousse is much more like being at home, setting it apart from the social norm of fine dining, and he has developed a successful niche for vintage French style and genuine hospitality. Before we begin our meal, he offers us glasses of Pellegrino, as well as Champagne with a touch of Chambord blackberry liqueur. We toast to a promising experience ahead, and eagerly await the first dish that has been chosen for our tasting this evening. To get our appetites going, our server Keifer presents complimentary crudités, which is a large basket of assorted raw vegetables including carrots, onions, romaine hearts, radishes, cauliflower, cucumber, red cabbage, and celery, with a side of the house-made vinaigrette for dipping. This is a signature aspect of Pamplemousse that is offered instead of the typical salad, and it has been a favorite since the beginning of the restaurant’s history. We are told that there are many locals who would stop coming if small things like this were to change, and Georges has no intentions on disappointing his valued guests. Another key factor to the success of Pamplemousse is the creative menu, full of classic French favorites and more unique house specialties. Many people come to enjoy the convenience of the two prix fixe menus which change regularly to reflect the season, while others choose to enjoy items from the Menu a La Carte. Begin with scrumptious hors d’oeuvres including traditional items like French onion soup gratinee with Swiss cheese, escargots bourguignone with shallots, garlic parsley, butter and Chablis, or shrimp scampi, flambéed with cognac, herbs, garlic, and tomatoes. For more fulfilling dishes, entrees such as the grilled wild salmon with Champagne sauce, the braised veal osso bucco, a grilled hanger steak, marinated in olive oil, as well as filet mignon and grilled prime rib eye offer a fairly diverse selection of different proteins. In addition, sides like pommes frites, roasted garlic mashed potatoes, asparagus, and French green beans are always offered as add-ons to any dinner. Keifer tells us that of all the entrees available, there are two that he would call true Pamplemousse specialties: the duck breast and leg confit (the house favorite) and the rack of lamb. So I have high hopes that Georges intends on letting us taste both. For those who like to save room for some dessert, Pamplemousse is happy to serve eight specialty confections, three of which must be pre-ordered, since they require 25 minutes of preparation. It is these three, the Hot Chocolat Lava Cake along with the Grand Marnier and Chocolat Soufflés that really catch my eye, and I can only hope that I am able to make it to the end of this excursion with enough space to enjoy a sweet ending. After foraging for a few minutes, perusing the menu and enjoying the crisp veggies of the crudités with the sharp flavor of the vinaigrette, we sit back as Keifer lays out two hors d’oeuvres from the Menu a La Carte. We have in front of us Le Foie Gras “Au Torchon” and the Bouchee De Fruits De Mer. The simple, delicate presentation of the foie gras and the aromas rising from the steaming seafood make my mouth water. Keifer smiles while he recites his detailed descriptions of each dish. At one time, Pamplemousse had no formally written menu, so the waiters were required to know every dish and ingredient by heart. Having been a part of the Pamplemousse team for quite a few years now, Keifer is definitely an expert. It isn’t often that you come across such dedication to quality service. Inside Pamplemousse, it seems like second nature. The foie gras is served chilled, with two slightly pink round slices, aspic (a jelly made with meat or fish stock), and several brioche bread triangles. The meat is very rich, and I love the way I can spread it onto a piece of brioche with a bit of the savory jelly. The simplicity of such a traditional dish is amazing, and I imagine that I can’t be the only one who is wishing there were more. The buttery consistency creates a lingering, pungent flavor between bites, so to help cleanse our palates the foie gras is paired with a small fluted glass of Sauternes, a French dessert wine from the Sauternais region of Bordeaux. It is very sweet, with a slight bite at the back end and a heavy consistency that complements the foie gras. The bouchee, which is a very flaky French pastry, is loaded with decadent offerings from the sea. There are thick scallops, shrimp, and lobster, sautéed together with saffron, a touch of garlic, and a bit of mushrooms, then finished with cream and a cognac white wine glaze. The sauce adopts the bold, salty flavors of the mixed shellfish and soaks into the bouchee pastry, creating a mixture of soft and crunchy textures. The scallops are tender and piping hot all the way through, and the shrimp snaps nicely when I bite into it. I can see the small red flecks of saffron; it’s not common to find such a rare and powerful spice in a simple seafood appetizer such as this. The flavor is certainly noticeable, but not overbearing, offering a subtle twist to this already luxurious combination of flavors. This is French cuisine, utilizing bold, fresh ingredients heightened by plenty of cream, butter, and seasoning. Georges peers around the corner to check on things, and I give him a sincere nod of approval. For our main course, it only seems fitting that we try the house specialty, Le Magret De Canard & Cuisse Confite, or in English, the duck breast and leg confit with the option of either a cranberry-raspberry sauce or an Armagnac peppercorn sauce, garnished with mixed wild rice. This is probably the most ordered dish at Pamplemousse, but in a close second is Le Carre D’Agneau De Printemps, a full rack of spring lamb with a pistachio crust, light rosemary sauce, and authentic pommes frites. Lucky for us, Georges decides that we shall try them both, and receives no argument from me, as I was hoping for this all along. Before leaving us to begin preparing our entrees, he takes the time to recommend a bottle of Chateauneuf du Paupe, a classic, high-end French wine that is quite well known. Made with a variety of different grapes, it is a full-bodied red named after the famous castle erected by Pope John XXII as a symbol the appellation. Keifer pours our glasses then empties the bottle into a large pitcher, which is left with us at the table. This allows him to quickly and easily refill our glasses should we begin running low. He takes a moment to explain that Pamplemousse offers a first-class selection of wine to match the quality of the fine cuisine that they prepare. The list is very straightforward, with Champagne, reds, whites, rose wines, and dessert wines spanning France, Chile, Italy, and California. My Chateauneuf du Pape has a slightly spicy aroma, with sweet fruit flavor at first, followed by a somewhat peppery finish. It is delicious, and will obviously complement the bold, red meat of our dinner entrees. I admire my wine while Keifer sets up for the main event. The duck breast is thinly sliced, placed in a small pool of the chef-recommended Armagnac green peppercorn sauce, and the leg confit sits atop steamed baby carrot and asparagus. I begin with the leg, which has a very crispy, flavorful skin. Contrary to the outer layer, the meat is fall-off-the-bone tender, a sure sign that no detail was overlooked during its preparation. I make short work of the confit, and I must say it is refreshing to try something slightly different from the common chicken dish. The duck breast cuts easily with just the side of my fork, and the succulent pink meat has absorbed the rich peppercorn sauce. Each bite is juicy, tender, and loaded with the unique and distinct notes of pepper. The flavors blend seamlessly, and a quick bite of carrot or asparagus between slices is the perfect crisp palate cleanser. I also like how the fresh vegetables light up the plate with their vibrant orange and dark green coloration, which stands out next to the darker meat. Overall, I believe this dish deserves its standing as the house favorite, and I’m sure there are many others, including Georges, who would agree. The lamb, served as a full rack, is also extraordinarily tender, and although I have enjoyed similar dishes many times before, there is something noticeably different about the recipe here at Pamplemousse. After a short deliberation, I decide that it has to be the pistachio crust. Adding to the light rosemary sauce, the pistachios create a crunchy, roasted accent to complement the bold, juicy meat. The rosemary is not overpowering, but instead provides a subtle hint of the pungent herb, and with a sip of wine to wash it down, I finish every morsel. The meal is really winding down, and we have only dessert ahead of us now. This is no meek undertaking; as I mentioned before, there are eight hand-crafted creations to choose from. Luckily we waste no time deciding, since two desserts have been chosen for us. Keifer presents the Profiteroles Au Chocolat, which are cream puffs filled with vanilla ice cream, chocolat sauce, toasted almonds, and Chantilly cream. Then, he lays out the Grand Marnier Souffle, topped with vanilla ice cream and Chantilly cream tableside. Not sure if I have the stomach capacity to finish the delicious sweets before me, I make sure to get at least a taste, especially since I have been hoping to experience the soufflé. Since the fresh scoop of ice cream is slowly melting over the hot, airy cake, I decide to begin here. The ice cream is made in house, and it is thick, rich, and sweet. The soufflé itself is so light and fluffy it seems to dissolve instantly as I chew, and the batter absorbs the cream for even more decadence. Soufflé falls into the category of difficult when it comes to desserts, and ours has been prepared perfectly. The profiteroles are quite a classic Fench dessert. The cream puff pastries are dense and flaky, making the perfect pairing for the toasted almonds and chocolat sauce that cover the fresh vanilla ice cream. I limit myself to just one, though I find it hard to move on after the first, since the flavors blend so well and the roasted almond and bold chocolate flavors linger on my palate. Pamplemousse has been an experience above and beyond my expectations. I know that they receive wonderful reviews from their valued guests on a regular basis, but words are not enough. This is a restaurant you must experience for yourself to fully understand its many different qualities. The interior is a beautiful recreation of a cozy French cabin, complete with dark woodwork, candlelight, and the original fireplace. Since 1976, Georges La Forge has changed very little about his restaurant, and I can see he has no need to. Locals love him and Pamplemousse is a wonderful destination for any romantic night out or special celebration. The genuine hospitality never skips a beat, and dining here really does feel like home, where you can relax and enjoy good conversation with good company. To put the icing on the cake, Pamplemousse shines with a menu full of authentic French creations made with only the highest quality ingredients. When it’s all said and done, this quaint little French getaway is a place I will not soon forget, and I am already planning my next visit. Insider Tip: Taking the shuttle is a fast and simple way to traverse the busy strip, so having Sahara Station so close creates a convenient means of transportation for Pamplemousse guests. Sometimes, I want to explore more than the hotels, casinos, and restaurants lining Las Vegas Blvd, but I don’t always have a vehicle in the city. Knowing that I can hop on the shuttle to make it to dinner is a big plus. Main Dining Room | Dinner 5 p.m. - 10 p.m.
Tax and gratuity are not included. Please inform server of any allergies. 18% gratuity on parties of 6 or more. Split plate charge $12.00. This is a sample menu only. Prices and availability are subject to change. per person four course menu. No substitutions please. Menu and availability are subject to change. Split plate charge $12.00. Tax & gratuity not included. 18% gratuity for parties of 6 or more. per person five course menu. No substitutions please. Menu and availability are subject to change. Split plate charge $12.00. Tax & gratuity not included. 18% gratuity for parties of 6 or more. Very friendly and prompt service, good explanations about the restaurant and the menu. The staff were very acommodating as we were also having a business meeting over the meal. The food was some of the best I have had in Vagas and at a very reasonable price.